Catalonia: Do they deserve a referendum too? Although Scotland has probably been the most visible, there are many independence movements going on throughout the world. Perhaps the next most likely will be Catalonia, an autonomous region of Spain– home to Barcelona and the strongest part of the Spanish economy. However, while the UK allowed Scotland to hold a referendum concerning their independence, the Spanish government is not allowing Catalonia the same privilege. The fight over Catalonia’s future is proving more contentious and has turned into the biggest political challenge for Mariano Rajoy, Spain’s prime minister, since he took office in late 2011. Mr. Rajoy has vowed to prevent a secession vote, scheduled for Nov. 9, saying it would violate Spain’s Constitution. Should Catalonia be able to a vote similar to Scotland’s? Or is Mr. Rajoy justified in blocking one? Read more here. In my gender and politics class earlier this week, we read a research publication entitled “Gendered Discourse in the Political Behavior of Adolescents.” In this publication, they wanted to measure whether gender discourse in Model UN is highly masculinized and if so, what effect does this have on its participants. – Male delegates took 1409 speaking turns, 67.6 percent of the 2082 turns recorded in committee deliberation. -The vast majority of female delegates participated only minimally if at all, while a larger proportion of males took turns. -Male delegates also spoke first, taking 72.0 percent of first turns, a proportion higher than that of overall turn-taking. 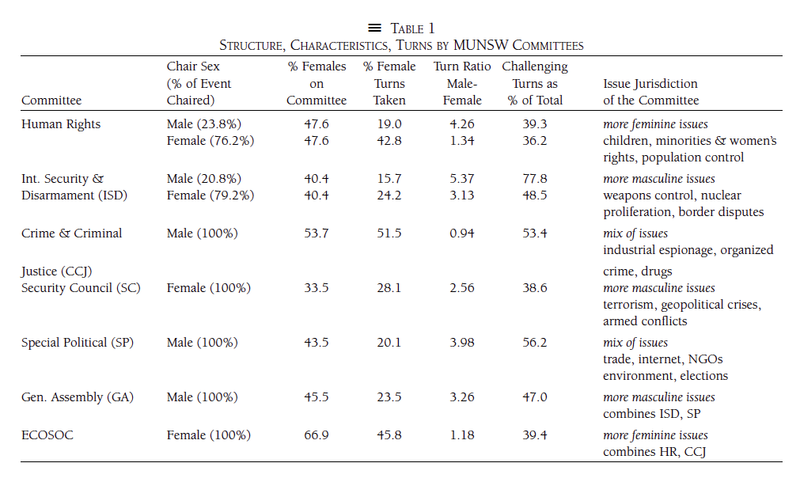 -The role of the chair is critical -> on average, male chairs recognized just over three male turns for each female turn, while on average female chairs recognized 1.67 male turns for each female turn. -It appears the delegates did not alter their behavior based on whether the initial speaker was a female. -A female chair presiding over the committee is significantly and positively associated with female turn-taking. -Females are more likely to take turns in larger committees presumably because there are simply more females present. What are your thoughts on this? How would your strategy going into a conference change, based on this research? Do you think this isn’t an issue? I dare you to say no…..
“Limited Tools in Hong Kong: China’s Usual Steps May Be Inadequate” by Edward Wong & Chris Buckley. If Levy’s article were to be correct in predicting the outcome of the ever ongoing race between the U.S. and the PRC, it would be expected that this transition of power from the U.S. to the PRC would eventually lead to all out war. This bid for hegemony by China could take this more realist route utilizing both latent and military power to seize the dominant position but in reality the latter is less likely, although at times China does not seem shy in flexing its military muscle. The more likely approach would be to use its more latent influential power, whether through its rising and very strong economy or through other less violent means. But if it were to even try to finally burst through the tape and be seen as the new dominant power, there would have to be necessary changes and transitions applied to the current situation in Hong Kong. China’s inability to deal with the current pro-democracy movements rampant in Hong Kong will be a determining factor in their bid for becoming the next super power. The tools implemented and the strategies used by the current regime in dealing with the protesters seem to remind us of a not too distant past in which the government “poisoned China’s relations with the outside world.” This event of course is the demonstrations that took place in 1989 at which blood stained the already emblazoned Tienanmen Square. The key is compromise. The factors is willingness and foresight necessary in establishing a better way of working with Hong Kong and in reality working with the fearful democracy the “People’s Emperors” fear. The Chinese must change their ways of dealing with situations like this in order to survive. If their bid for a spot on the world scene as an integral if not more important player than the U.S., they had better figure out a way to embrace the two-system China that keeps stability and ensures fewer democracy protests yet keeps China in the race for economic power. Mount Ontake is a popular hiking spot in Japan. Unfortunately, it erupted this last Saturday around noon. Five hundred rescuers went out to look for a group of climbers that Sunday. However, those efforts were halted because of darkness and strong sulfur odors. This made it seem that it was possible for another eruption to occur in the next few days. However, those five hundred rescuers continued their search the following Monday. Not only did this horrible natural disaster occur in the month of September, but at the beginning of the month heavy amounts of rain triggered a landslide, killing more than seventy people in Hiroshima. All of the surrounding of Japan’s Mount Ontake Volcano was encompassed with thick volcanic smoke and darkness. Some Japanese rescuers were willing to sacrifice their lives for the search of these climbers, saying they were prepared to face death. On that Monday following the eruption, Japanese officials found 31 people who had gone into cardiac arrest. They feared that those people have died. They haven’t made a formal declaration and will not until a medical examination takes place. This has not yet been reported. Mount Ontake rises 10,000 feet to the top of the mountain’s peak. The remaining ash was said to have spread around 2 miles. It is Japans’ second-highest active volcano. The first is the 12,000 foot Mount Fuji which last erupted in 2007. The government says the country has over a hundred active volcanoes. The Prime Minister of Japan, Shinzo Abe, has ordered the country’s military to help in the rescue efforts. This was the first fatal volcanic eruption in Japan in the last 14 years. Is the holiday merely another way to honor the dead who have served China, or is the issue more deeply rooted? Read more of the New York Times article here. Many critics contend that his decision to pull all American troops out of Iraq in 2011 and his lack of more direct interference in the Syrian civil war is a strong reason that the region has become “ground zero for jihadists around the world.” Obama denies this and said that when Americans left, they had left Iraq with all the proper tools necessary to prosper: an intact democracy and equipped military. However, while ISIS has surprised officials, Syria still is regarded as the “more challenging situation.” To what extent do we collaborate with Arab nations to counter the ISIS movement and to what extent do we instead focus on the tyrannical regime of Syrian President Al-Assad? There remain many concerns with the inconsistent methods of Obama, according to Democrat Senator Timothy Kaine. Whatever the choices, Obama’s decision to act unilaterally raises many questions, as it has for many years through more than one presidency. The real irony is that he ran on the campaign that “the president cannot unilaterally start a war without Congress.” It seems to be an act of naivety to claim this in the beginning; as one becomes accustoms to the realities of wasted time and partisan disagreement, more and more frequently presidents seem to forgo the established methods of checks and balances. In a lecture given to BYU students and faculty last Wednesday, former Deputy Secretary of State John Negroponte spoke extensively on the troubling situations the United States faces abroad. He spoke, in part, about the threat ISIS poses to the international community and gave his opinion regarding the solution. In recent weeks the Untied States, as well as European and Middle Eastern nations began strategic bombing campaigns of key ISIS targets in Iraq and Syria in order to bring relief to a struggling Iraqi army. Secretary Negroponte said that this was not sufficient to end the threat of the extremist organization in the region. Secretary Negroeponte has been one this country’s brightest diplomats for the last 40 years, but that is not why anyone should agree with him. What he says is logical. When an airstrikes takes place enemy combatants are killed thus shrinking their fight capacity. However, that loss of life is only a temporary setback in the minds of the ISIS leaders who are busily attracting thousands of fighters from recruiting hubs around the western world. International agreements will soon be put in place to limit the influx of new ISIS soldiers, but the problem lies in the heart of Syria not with the expatriate fighters. As the coalition bombs ISIS targets they are soon replaced by new resources and trained fighters. With no ground forces to take the positions destroyed by airstrikes and ensure their lasting effects; the destruction of the ISIS hubs are of little consequence. When a gardener removes a weed from their garden they don’t not wear down each leaf with a nail file. The nations who wish to see ISIS only as a section in a history book need to rip ISIS up at its roots. Airstrikes alone only scratch the surface without confronting the real problem. In this case, the problem is that ISIS has now spread its roots all over the world. ISIS is cropping up in the Philippines, where two westerners were being held hostage, Algeria, where a French man was beheaded by ISIS supporters, and Belgium which is hotspot for extremist recruiting. Accepting that ground forces are needed to stop the spread of violence from reaching any further, the question that the international community must discuss next is “who is going to take the lead?”. Most people would look to the United States (Including itself) who has been, by comparison, rather gung-ho when it comes to Middle East intervention, but this fight cannot be only America’s to handle. There are signs of hope that many nations will put their full weight behind ending this conflict and provide security to the region. Without wide international participation the following conflict could be viewed, merely, as another American show of force for the world to scoff at. However, the recent refusal of the French government to corporate with terror demands and the British parliaments support of the coalition makes me think they are willing to make stabilizing the Middle East a priority. Each nation must contribute equally to successfully undermine radical Islam. The idea will never disappear, surely, but world wide involvement, rather than pushing the responsibility to the “locked and loaded” US, will guarantee that everyone has an interest in resolving the seemingly unresolvable stability crisis caused by extremism in Iraq and Syria. Each nation must see the merits of creating a self sufficent and credible government in developing countries like Iraq. Each nation must imagine a more peaceful world, free of the constant tragedies emerging from the Middle East. Is it worth it? But winning the space race is more than just a matter of national pride; India hopes that the impressive accomplishment will draw further attention to India’s low-cost tech skills (currently already the nations greatest export) and boost their economy. With so much distraction and anxiety governing the international climate right now will putting an orbiter on Mars succeed at drawing the attention of the international community with enough force to boost India’s economy? As a result, multinational corporations, the U.S. military, and now faith groups (including prominent Mormon thinkers) are pushing the new “consensus” into policy. What we see this week at the UN is another manifestation–including the Copenhagen Climate Change treaty from last year. 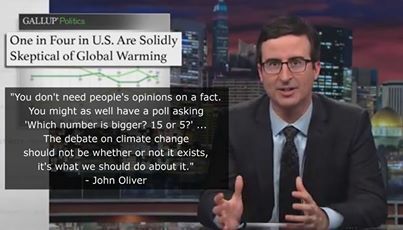 No less than John Oliver has visualized (with a degree of ridicule) the nature of the “debate” (language warning if you seek out the video). It was the usual post-communist leftie march. That is, it was a petit-bourgeois re-enactment of meaningless ritual that passes for serious politics among those too inexperienced, too emotionally excited or too poorly read and too unpracticed at self-reflection or political analysis to know or perhaps care how futile and tired the conventional march has become. Crazed grouplets of anti-capitalist movements trying to fan the embers of Marxism back to life, gender and transgender groups with their own spin on climate, earnest eco-warriors, publicity-seeking hucksters, adrenalin junkies, college kids wanting a taste of the venerable tradition of public protest, and, as always, a great many people who don’t think that burning marijuana adds to the world’s CO2 load, marched down Manhattan’s streets. The chants echoed through the skyscraper canyons, the drums rolled, participants were caught up in a sense of unity and togetherness that some of them had never known. It was almost like politics, almost like the epochal marches that have toppled governments and changed history ever since the Paris mob stormed the Bastille. Almost. Except street marches today are to real politics what street mime is to Shakespeare. This was an ersatz event: no laws will change, no political balance will tip, no UN delegate will have a change of heart. The world will roll on as if this march had never happened. And the marchers would have emitted less carbon and done more good for the world if they had all stayed home and studied books on economics, politics, science, religion and law. Marches like this create an illusion of politics and an illusion of meaningful activity to fill the void of postmodern life; the tribal ritual matters more than the political result. 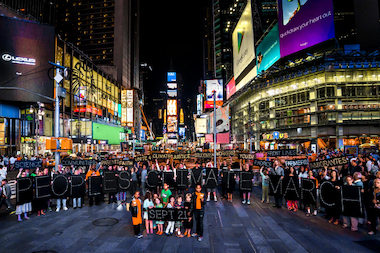 Even the New York Times ruefully concedes that this week’s climate summit is unlikely to create the kind of breakthrough climate framework agreement that the protesters in Manhattan were agitating for today. After all, Germany’s Angela Merkel has taken a pass on attending the meeting, as have China’s Xi Jinping and India’s Narendra Modi. via The Most Futile March Ever – The American Interest.